In days gone by it was the custom for a country lad to take an evening walk with his lass in the fields at harvest time. He would weave for her a buttonhole of plaited straw, and if they were courting, she would wear it over her heart as a token of her love. At the annual hiring fairs at Martinmas, men and women might have worn a simple plait decorated with a wisp of sheep�s wool or horse hair, as a badge of their trade, ie shepherd, waggoner, etc. 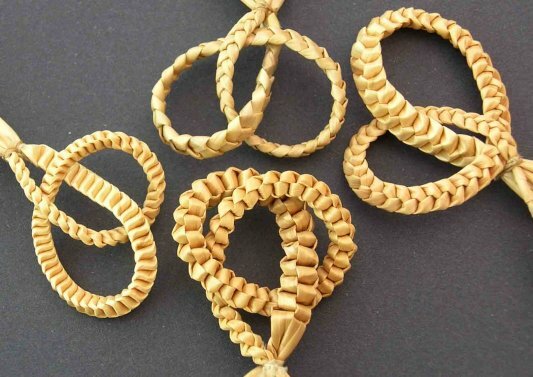 The Countryman�s Favour is a simple but delightful corn dolly and can be made with various plaits such as a 2-straw Plait, a 3-straw Catfoot Plait, a simple 3-straw Hair Braid, a 4-straw Compass plait or a 5-straw Spiral Plait. For a simple single loop favour, the 4-straw Compass Plait gives an attractive chunky weave. Tie four straws together with a clove hitch just under the heads. Plait until you have about 8 cms of straw left. Bring the four straws up to meet each other, and tie firmly at the end of the plaited section with another clove hitch. Bring this tie down to meet the other tie just under the heads, to form a loop of plaited straw, and tie the two together. Spread the wheat ears out between the wheat stalks and allow to dry flat, preferably under a weight. 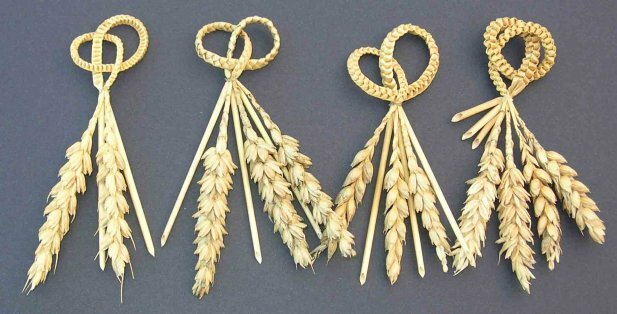 When dry, you can clip the stalk ends decoratively, and add a ribbon bow or a small sprig of dried flowers. With a slightly longer length of plait, you can make a simple looped favour. A 2-straw plait, a 3-straw hair braid, or even a Rope Plait is ideal for this. When you have completed and tied off your length of plait, again leaving about 8 cms of straw, you can intertwine the plait into a double knot following this diagram. 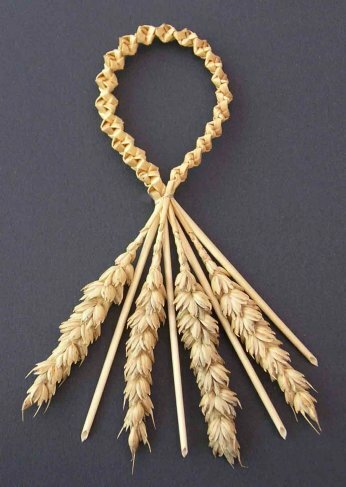 Then take the end straws round to the back and tie to the wheat ears. Decorate with a ribbon, if you wish. You can make your favour more elaborate by adding extra loops, mixing plaits � use your imagination and see what you can come up with! These favours also look great on a rush hat. For more favours, have a look at Guild member Elaine Lindsay�s website: www.somethingcorny.co.uk. Her favours, including Celtic knots and the double knot favour can be seen on her Wedding Collection page. As well as sheaves that you have to prepare yourself Rosemary sells prepared straws in multiples of 100 (400, 800 and 1,000 are the most popular multiples). Buying prepared straws takes away the drudgery of preparing your own straw and having to clean up afterwards. Rosemary is a Guild member and has her own web site - Simply Straw.